Recently, Chestnut joined showrunner Todd Harthan to answer some questions for the press. Read on to find out why you should watch, why Rosewood professionally pursues Villa, what they think of sharing a night with EMPIRE…and who has the best wardrobe — Morris or Rosewood. What are the reasons Rosewood professionally (for now) pursues Detective Villa? What makes her stand out? Morris Chestnut: Well, at first I think — okay, aside from her obvious beauty and sexiness and all of that, I think he definitely respects her because she’s good at her job. And he realizes that professionally both of them together, obviously he feel’s that he’s very confident, feels that he’s good at his job, but professionally together they can achieve great things. When you name a show after the main character, sometimes it can be hard to have an ensemble feel, though based on the pilot, the cast has the chops to do that. How are you going to balance Rosie’s storylines as the main character with storylines for other characters? Todd Harthan: I have to say, it has actually happened kind of naturally. It might just be born from the fact that Rosewood has such a connection to other people around him, and that quality, in our writers’ room, has kind of just sparked natural stories for other characters that aren’t always solely about him. It could be about Lorraine Toussaint’s character Donna (Rosewood’s mother), who is the matriarch, or his sister Pippy (played by Gabrielle Dennis). Obviously we also have a very strong female lead in Jaina Lee Ortiz. It’s just one of those things that our episodes have sort of bred stories that are not always solely about what’s going on in Rosewood’s life, and for the most part, we feel like here, before everybody’s seen it, we feel like it’s really working. MC: Let me just elaborate on that really quickly because that’s actually one of the things that I love about the cast and what Todd has assembled. Each one of our cast members, not only are they very strong actors, but the characters are so deep, and they’re going to be developed so much. Where eventually you can see one character, any of these characters, having an episode focused completely on them, and it will be carried out seamlessly. The actors are so adept at what they do. That’s what I love about being part of this show. Can you talk about what it feels like to be paired up with EMPIRE starting out? TH: Thank you. I don’t know if you’ve heard, but EMPIRE’S doing alright for itself. [Laughs again] It’s an amazing timeslot. We are happy to have it. The promotional campaign that Fox has put together both for our show and some of the crossover promotion stuff with EMPIRE is incredibly great and helpful in trying to get as many people to come and check out and hopefully fall in love with ROSEWOOD as possible. But it’s amazing. It’s amazing to be on before a huge juggernaut. Okay, one more question for fun — who has the better wardrobe, Morris or Rosewood? MC: [Laughs] Well, it depends on where you’re going and what you’re doing. I mean right now I think Rosie has the better wardrobe, but I’m catching up. I’m going to try to catch up. 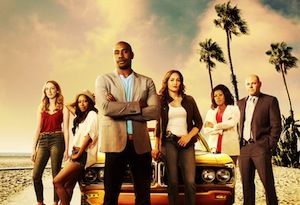 ROSEWOOD airs Wednesdays at 8 PM on Fox.